This product review was completed by Everjourney, a project motivated by the adventure and freedom of cycling. Follow along: everjourneyproject.com and @EverjourneyProject. 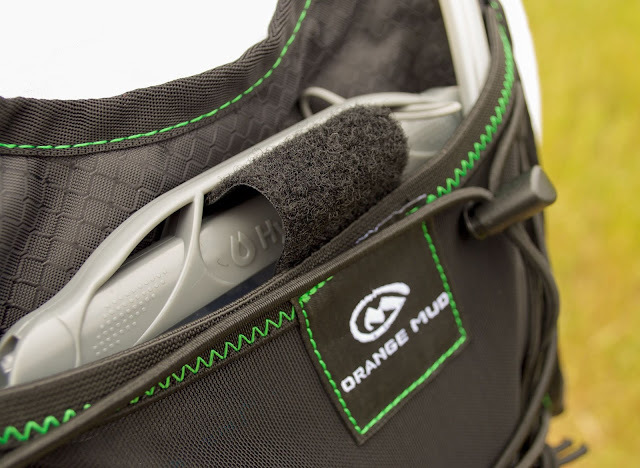 Sprouting from the need to develop an ideal hydration pack, Orange Mud has populated the market with a variety of hydration packs and gear vests, all while meeting the needs of cyclists and runners. 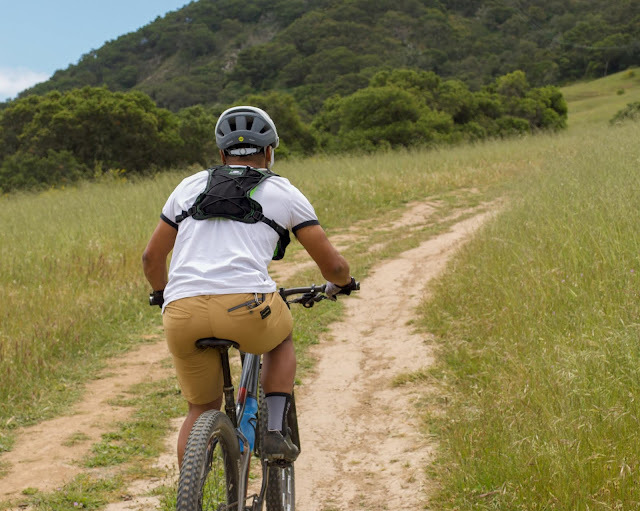 With a company name that traces its roots back to Kansas, it was only fitting for us to review the Orange Mud Gear Vest, for both mountain biking and gravel riding. In recent years, Dirty Kanza 200, a premier gravel event in Kansas, has been stacked with hydration pack use, due to the need to be self-sufficient for extended periods of time. From the front, the Orange Mud Gear Vest. From the back, the Orange Mud Gear Vest. While considering the Orange Mud Gear Vest, a primary focus included testing the limits of this pack for extended periods of time. In turn, simplicity, functionality, and comfort became apparent. The Gear Vest offers an array of options, all while remaining simple, sleek, and minimal. 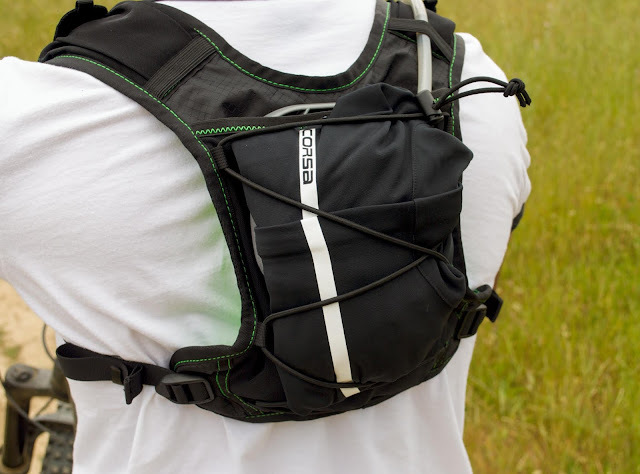 In total, the vest offers six frontal pockets, which allows for bar, gel, and flask storage. Two main, oversized pockets cinch tight, which allowed us to house an array of ride food, while forgetting about its security. Additionally, while on the bike, a CO2 cartridge was stowed away in these pockets. Surprisingly, while storing enough energy to feed a small posse, as well as carrying tire-inflation necessities, the vest refused to sag or become cumbersome. Unlike a saggy, sopping jersey that flaps around when weighed down, this vest conquered the storage task. With two main, oversized pockets that cinch tight, storage is not an issue with the Gear Vest. In sticking with simplicity, this vest features one rear pocket to store one liter of water. Through a nifty opening in the HydraPak reservoir, the reservoir holds steady, while being fastened to the pack with velcro. Simply fastened with velcro, the HydraPak reservoir remains steady during use. 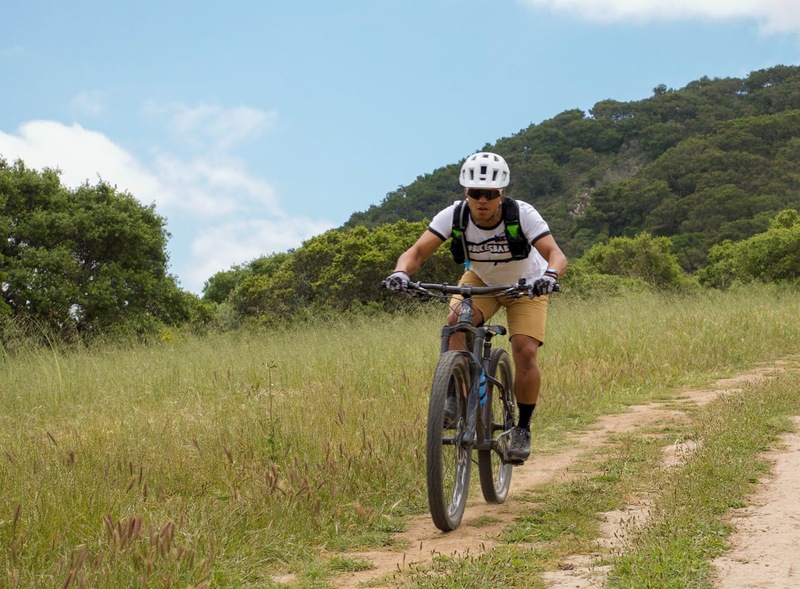 For both mountain bikers and gravel riders, vests are becoming more popular, all while offering supreme functionality and usability. 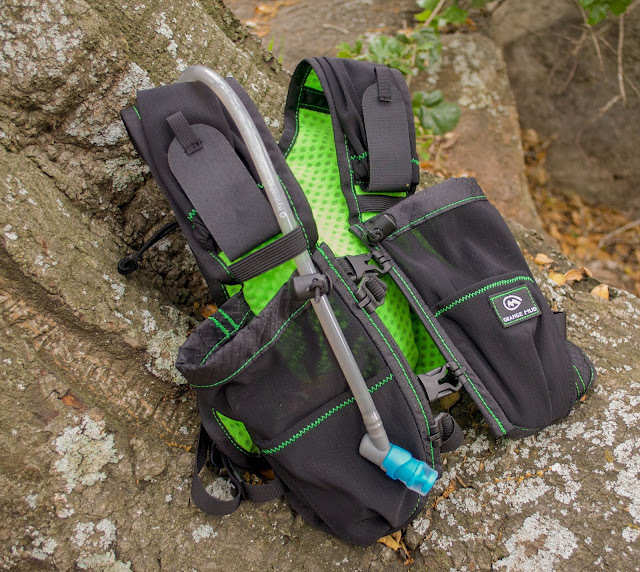 While checking all major needs, including oversized storage pockets, trash pockets, a substantial reservoir, and a shock cord to stash extra apparel, this vest still packs down to the size of a tissue box, all while disappearing on the trails. With its snug, lifted fit, it's extremely easy forget about the minimal pack, while descending in fervor. On the rear of the Gear Vest, a shock cord allows for apparel storage. 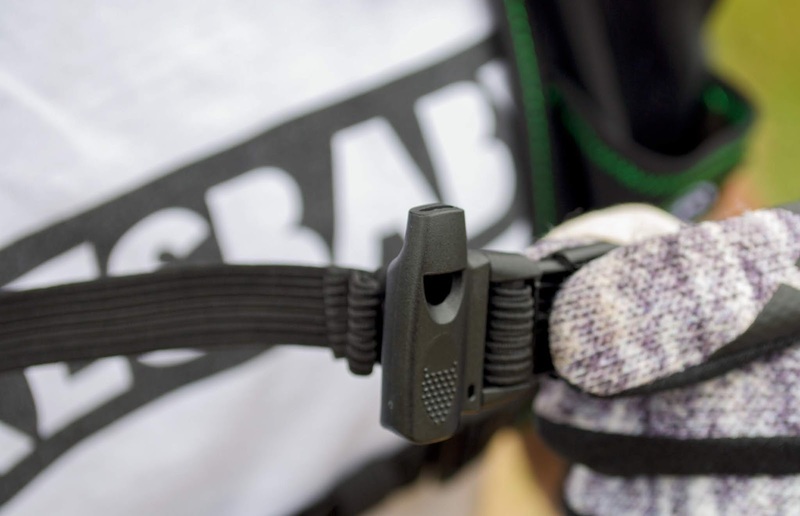 Again, featured on the rear of the Gear Vest, an adjustable shock cord is convenient. In sticking with neat features, a safety whistle is included on the upper, front adjustable strap. 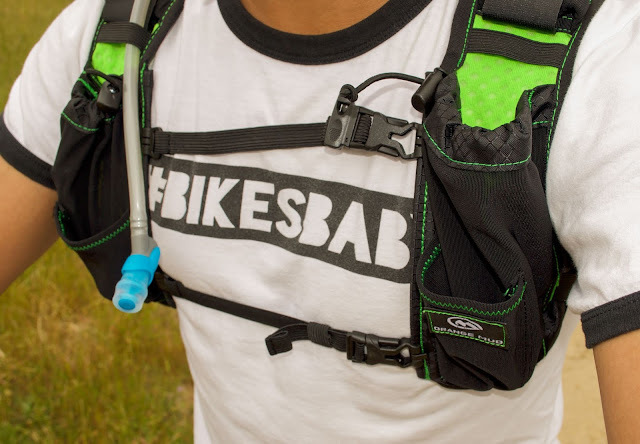 With the Gear Vest, its main piece of functionality incorporates a HydraPak reservoir with an ideal lockout bite valve. In expert fashion, the Gear Vest houses a one-liter reservoir that packs well and rides steady. 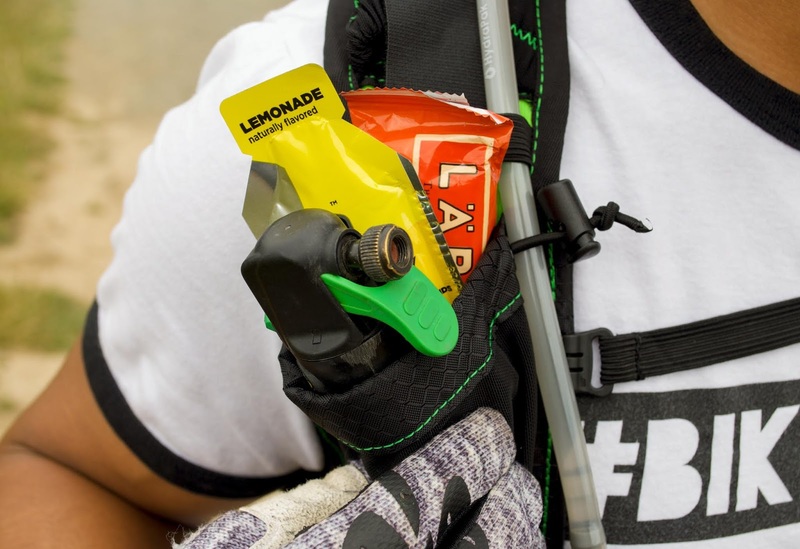 Often, shifting packs and tumultuous reservoirs ruin the convenience of riding with a hands-free hydration system. However, Orange Mud has solved this issue. 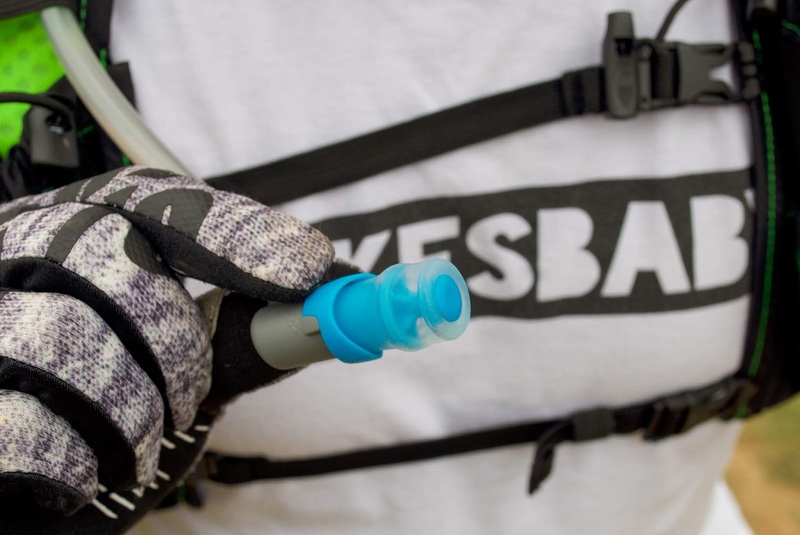 With the HydraPak reservoir, a lockout bite valve remains secure when not in use. The HydraPak hose has the ability to be cut to a shorter length, while remaining housed against the Gear Vest. While both simple and functional, no equipment is worthy of extended periods of use unless it is supremely comfortable. In the comfort department, Orange Mud is cruising. 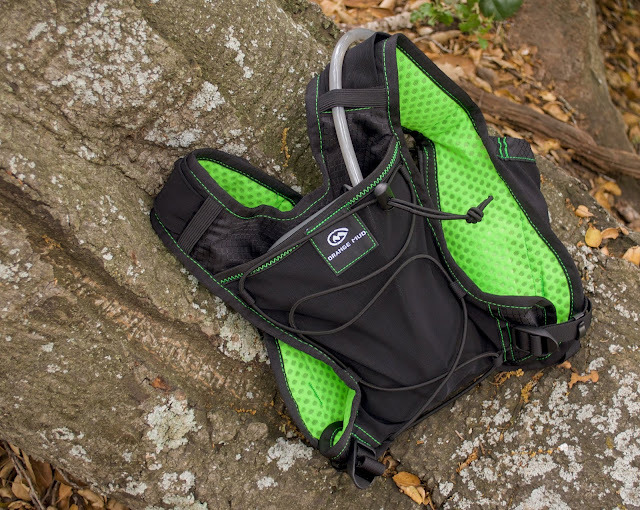 For the Gear Vest, four adjustable straps offer an ideal fit. On the left and right sides, adjustable straps remain snug against the body. 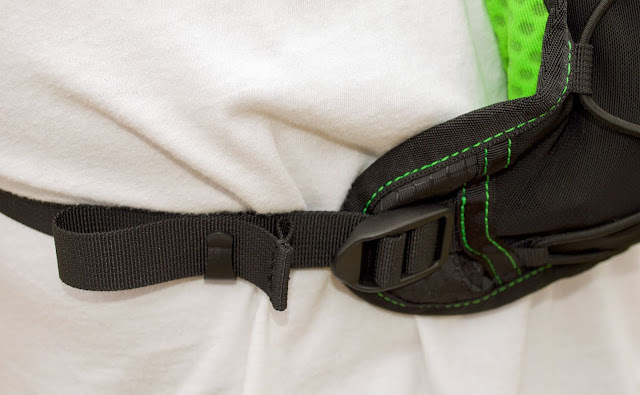 Then, once these straps have been adjusted, two chest straps swing from right-to-left, before clipping and connecting the shoulder straps. With a supreme fit, this vest does become forgettable, while conquering endless miles of trail. Side straps allow for a snug fit against the body. Overall, we're extremely pleased with the Orange Mud Gear Vest, a prime piece of design that offers simplicity, functionality, and comfort. 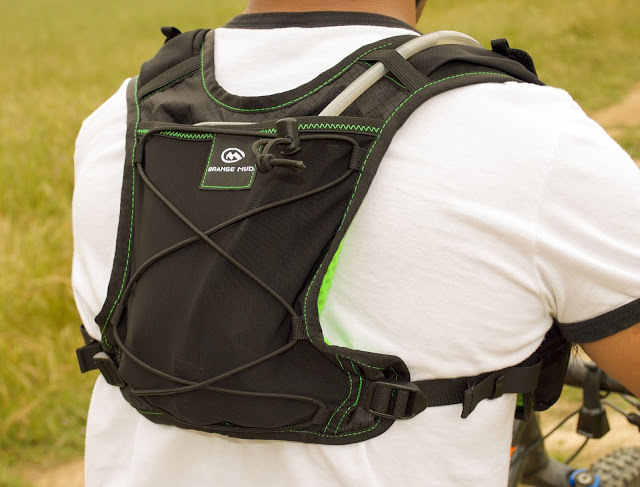 Ideal for both mountain biking and gravel riding, while looking to escape for extended periods of time, this vest offers great storage, a quality reservoir nest, and ingenious bits and bobs, including a shock cord and safety whistle. For those considering the move to hands-free hydration, look no further than the Orange Mud Gear Vest.